As we clear the causeway and motor slowly towards the west side of the reservoir, the grey sky and choppy water make a perfect backdrop for loch-style fishing on this mild September morning. In the afternoon the sun appears, and the trout move off. For this session Brian uses a mixture of bright and drab traditional wets . 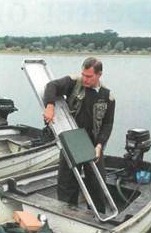 Without a thwart board to help you sit and fish comfortably , prepare for a long, back-wrenching day. Consider retrieval speeds at all times while you’re in a drifting boat. 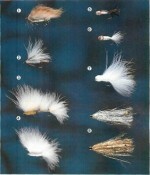 The trout may prefer flies stripped back ultra fast. At other times they take when you retrieve just faster than the speed of the boat. By car: Leave the M1 at junction 15. Take the A508 north towards Northampton. Carry on past the town of Pitsford until you see Brixworth. Turn right, and drive towards Holcot. The Fishing Lodge is signposted and is located on your left. By train: The nearest British Rail station is Northampton. With a short fly rod you can use more leverage against a battling trout than with a long one. 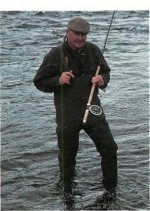 But a long rod (over 10ft/3m long) allows you to control the fish better – especially when landing it. Brian contends the issue with the first rainbow trout of the day. 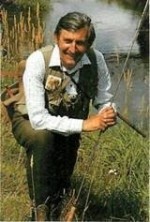 Notice how high he holds his rod as he plays the fish. There were countless takes throughout the day – as if the fish weren’t serious about feeding – but few solid hook-ups . 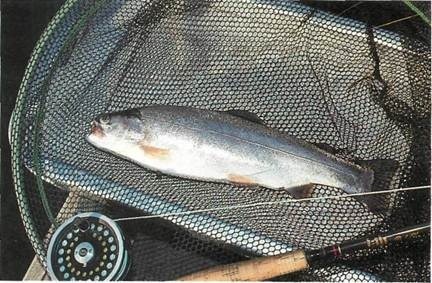 This trout was about average – in the 0.45-0.7kg weight range. Late in the afternoon Brian tempts his last rainbow trout of the day from deep water. It sees the net and darts off. 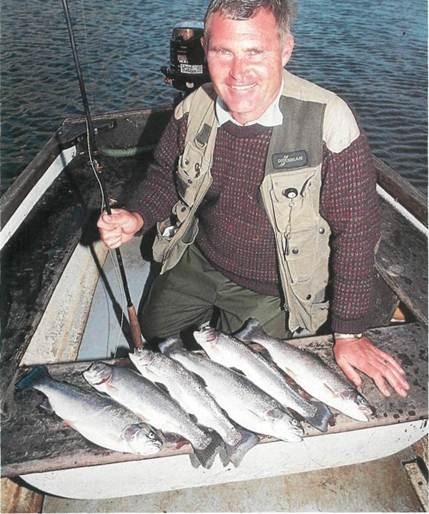 Brian with six typical Pitsford rainbows. Though very demanding, loch-style fishing can pay off when all other tactics are a waste of time. 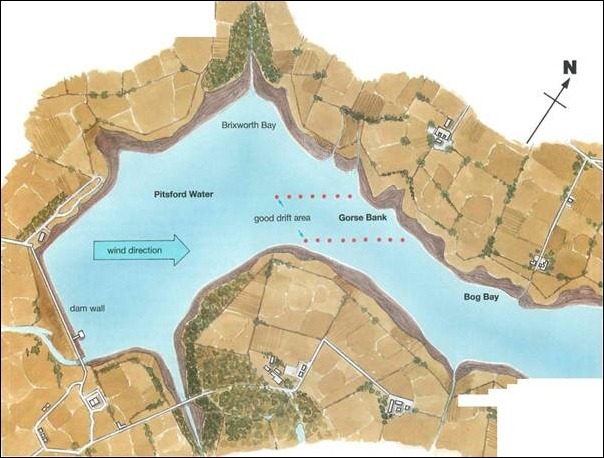 A northeasterly wind drives us towards Bog Bay, where rudd boil at the surface. They certainly aren’t rising to aquatic insects – perhaps the odd land-borne cranefly. On this morning not an olive is stirring, not even a midge. Close scrutiny of the shoreline reveals a similar tale. Brian fishes the first few drifts without feeling a pull or seeing a trout. Still on the move to find the fish, we motor upwind for another drift over a new area. Brian casts and controls his four-fly rig without trouble. 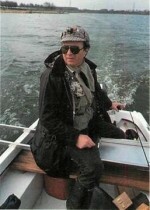 He makes short casts in wide loops about 10m (11yd) in front of the moving boat. Then he works his flies back quickly – the bushy bob fly ploughing through the middle of the waves and creating a show on the surface. 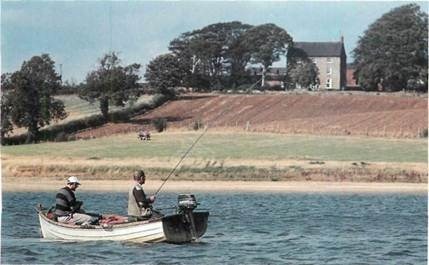 Drifting towards Gorse Bank a trout hammers Brian’s point fly just before he was about to recast. It’s a 0.7kg rainbow. About 50m (55yd) out and across from the bank a rainbow slices through the surface, chasing Brian’s bob fly for a few feet before taking it and turning down. But the excitement ends much too quickly: the trout comes off a few seconds later. Photographer Peter Gathercole is then in with a decent rainbow. We have found a large shoal. And then Brian hooks one solidly and lands it. The trout, however, makes a nasty mess of his four-fly leader. 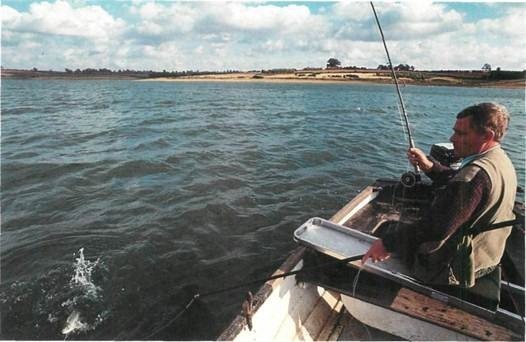 Brian motors us upwind of the trout for another drift through the shoal. ‘I’m not convinced that these fish are feeding. There hasn’t been any fly life coming off as such,’ he says. The rainbows are probably hitting the flies more out of curiosity than anything else. Before the shoal moves off, Brian has one more trout out of eight takes. Converting the takes into solid hook-ups is a taxing problem. In practice there isn’t a lot you can do to increase the odds – except perhaps move up in hook size (but this may dissuade the trout from taking the fly in the first place). 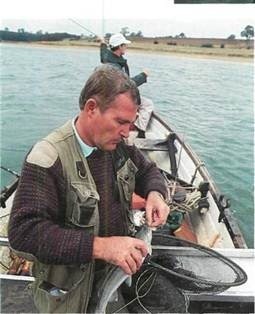 In calmer conditions an intermediate line might also help because the flies fish on the surface for the first few pulls then descend just below the surface. When a trout takes, it usually doesn’t miss and get a mouthful of air (as is sometimes the case when using a floating line). 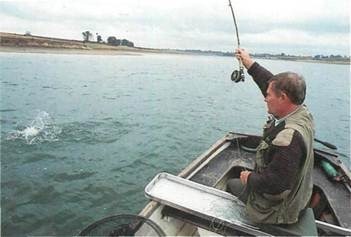 With rough water and large waves, however, it doesn’t really matter if you use a floating or intermediate line: for the most part the flies are carried on the waves, and trout sometimes miss them. 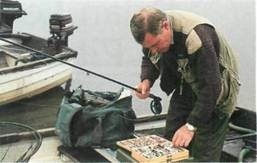 With a slow sinker you can’t work the bob fly attractively across the surface. The sun’s untimely and unwelcome arrival at about 1:00pm puts the trout down. We drift for nearly two hours without a sign oft fish. 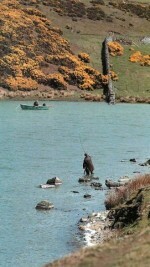 Many anglers start heading back to base, calling it a day, fed up with the difficult conditions and lack of trout. After two more hours Brian catches on more trout which rises from deep water to take the point fly. Although the day started with promise the discovery of virtually no insect activity and sunny, windy conditions later on made the fishing very difficult. But with four rain bows to his credit (and two for Pete Gathercole), he isn’t complaining. On the way up to the car park, the only thing we can think about is finding a decent restaurant as soon as possible.